Sting delighted audiences in his hometown with songs from his latest album and Broadway musical ‘The Last Ship’ last weekend in support of The Sage Gateshead’s 10th Birthday Appeal. The only UK performances of their kind were supported by Cunard in the shipping company’s 175th anniversary year. The musical, which ran for three months on Broadway this winter, focuses on the shipyards where Sting grew up on Tyneside, including the Swan Hunter shipyard where a total of 23 Cunard ships were built, including Mauretania and Carpathia, the ship that rescued every survivor of the Titanic disaster in 1912. On stage, Sting said he grew up with a shipyard at the bottom of his street. It had a profound influence on his life – because he determined never to work in the yard. When he watched the Queen Mother arrive in a chauffeur-driven limousine to launch one of the ships, he decided that one day he would travel in similar luxury. Which he eventually did, after finding fame as the singer in Police. Among the audience at one of the three performances at the weekend was a group of former shipyard workers, who later engaged in a Q&A session with Sting and the other performers, who included actor/singer Jimmy Nail, and folk music “royalty” from the north-east in the shape of Kathryn Tickell, the Unthank sisters, and the Wilson Family. 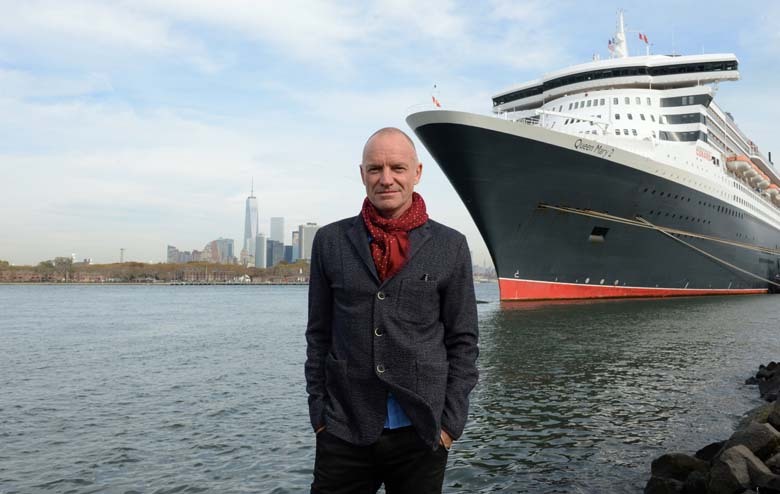 In October last year, Sting performed songs from “The Last Ship” on board Cunard’s flagship Queen Mary 2 in New York.